Human Resources and Skills Development Canada is responsible is the federal government department responsible for social and disability issues including income security, social development and ensuring an inclusive workforce. It is almost four years since we published Quest 80 which demonstrated that the ME/CFS and FM bring with them a high degree of disability (quite a number of people with ME/CFS and FM reported needing help with tasks, having difficulty in social situations and being permanently unable to work) and a high degree of disadvantage (quite of number of people with ME/CFS and FM reported low income, food insecurity and a sense of isolation from the community). These are the types of issues that HRSDC has responsibility for addressing. Despite this, the terms “chronic fatigue syndrome” and “fibromyalgia” appear on the HRSDC website in only two places. 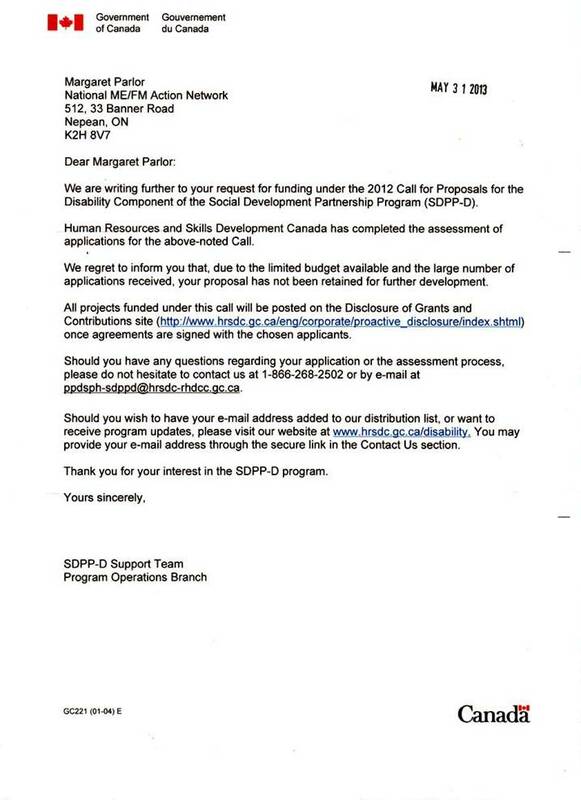 One says that the adjudication of CFS and FM applications for Canada Pension Plan Disability can be a challenge, and the other says that the CPP-D program has “a number of policies and reference tools on particular conditions (e.g. chronic pain, fibromyalgia and multiple chemical sensitivities)” but the materials referred to are not posted. It is both amazing and frustrating that HRSDC is not paying more attention of ME/CFS and FM. It is simply not possible to address issues like income security, social inclusion and workplace inclusion without considering the challenges faced by Canadians with ME/CFS and/or FM. We hope that the Minister will consider alternate ways of reaching out to the ME/FM community in Canada.